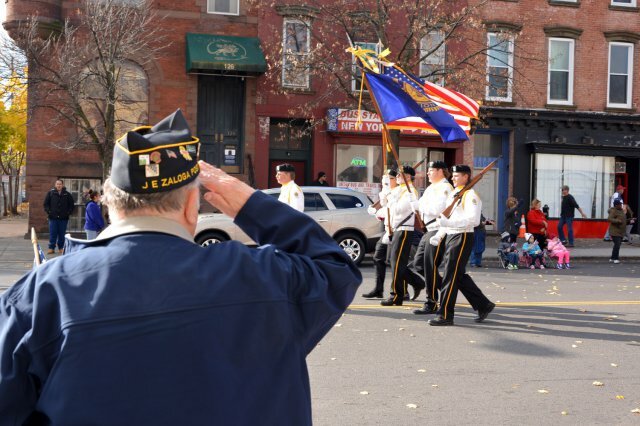 A veteran salutes while watching the Albany, N.Y. Veterans Day parade. When Congress decides to create a compromise bill for sweeping legislation such as the National Defense Authorization Act, it stands to reason that some items will be left on the cutting room floor. But apparently a proclamation calling for a moment of silence for veterans on Veterans Day did not make it in to the final version of the bill, which passed the House Dec.4. The original version of the bill that the House passed May required the president to issue a proclamation each year calling for two minutes of silence on Veterans Day. The Senate version of the NDAA did not contain the provision, and the final bill heading to the Senate no longer calls for a moment of silence for veterans.